CoInvestor is an investment platform that allows private investors to invest directly into alternative asset investments alongside professional fund managers. However, it is also an education hub for the alternative assets so private investors can research, learn and understand the market. As part of this, we explain the benefits of tax-efficient investing, portfolio diversification and making sure that investors really consider risk before allocating funds into this section of the investment world. While we are very excited by the potential returns and positive impact of investing in alternative assets, they are by their nature higher risk than more typical investments. Our view is that many of the platforms that are offering investors exposure to these types of assets don’t provide sufficient focus on the risk element of the investment and thereby are not properly supporting investors as their make their decisions. CoInvestor is committed to a quality service and a premium experience. Part of this is being razor focused on providing as much support as we can to ensure that our investors understand what they are investing in and why. 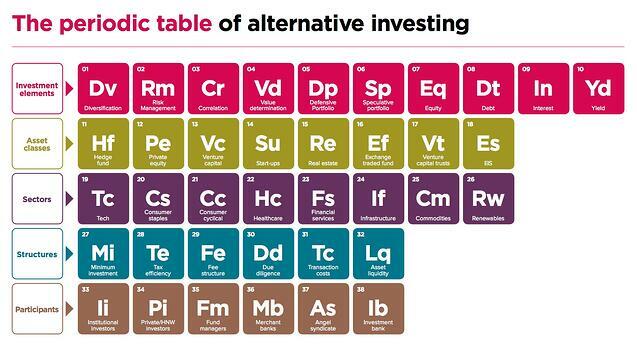 Whether you are completely new to investing and looking to start journey into alternative assets or already knowledgeable and just looking for a market wide snapshot, do check out our Alternative Asset Periodic Table. We hope you will find it an interesting read whether you are novice investor or a seasoned professional.